I love travelling a lot and I have been to all 7 continents. I wish I have more time to visit and appreciate all the different cities in the world. Please visit here for my travel diary and photo albums. I also like scuba diving, I am a PADI certified diver. A Chinese proverb says "To read ten thousand rolls of book, to travel ten thousand miles." 古人說，'讀萬卷書，行萬裏路'. To widen our wisdom by reading and exploring. Well, since neither my wife nor I are good cook, we enjoy eating out and thus have built up a list of restaurants in Hong Kong and elsewhere in the world. 《漢書˙卷四十三˙酈食其傳》：「王者以民為天，而民以食為天。」People rank food heavenly high. I like hiking and who needs an excuse to get away from the concrete jungle anyway. Since 1998, I started organizing many outings, you can read the hiking log and the latest events. I continue to organize many other events over the weekends. During my spare time, I like watching and writing about movies. I used to make movie too, I am a founder of the Cambridge Movies Workshop. My favourite directors are Wong Kar Wai (王家衛 ) and Krzysztof Kieslowski (biography "Double life second chance"). My favourite movies are "Ashes of time" (東邪西毒 ), "Days of being wild" (阿飛正傳 ), "Crying out love in the centre of the world", "Double vie de Veronique, La" ("Double Life of Veronique, The"), "Jean de Florette", "Manon des sources", "Cinema Paradiso", "Les Miserables" (The movie and the musical), "Life is beautiful", "Great Expectation" and "Happy Together". I like reading all sorts of books (business, history, fiction, biography, self-improvement, short articles etc). I wish I have more time to read. It is not easy to find the time to sit down and enjoy a good book. My favourite writer is 金庸 - (Prof. Louis Cha also known as Jin Yong), I started reading his novel when I was 11 and finished all his wuxia stories by the time I was 13. 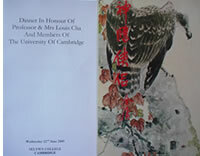 I was very honoured to be invited to the celebration dinner in his honour on 22 June 2005 in Cambridge - the day Prof. Cha received a honourary doctorate degree from Cambridge University. Very happy to have spoken to him and got his autograph. Another favourite author is Professor Richard Feymann, author of "What do you care what other people think", "Meaning of it all" and many other books, also his biography "Surely, you are joking Mr. Feymann". Visit my book review site for reviews of all the books that my friends and I read. 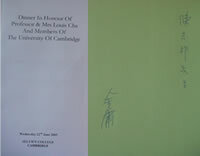 I'm an active member of the Executive Committee of The Friends of Cambridge University in Hong Kong. The Friends under Dr. David Li's leadership, provides scholarships for promising Hong Kong students to study in Cambridge University. We also organise regular events for our fellow alumni in Hong Kong as well as seminars for the local secondary school students. (Cambridge alumni site). I built and continue to maintain the alumni site for The Croucher Foundation which is a private trust set up by the late Noel Croucher, one of the founders of the Hong Kong Stock Exchange and a British businessman in Hong Kong for over 70 years. The Foundation specializes in promoting the standard of natural science, technology and medicine in Hong Kong through awards and grants to scientists based in and serving Hong Kong. Croucher Foundation has kindly provided full financial support during my PhD studies at Cambridge. I'm an active member of the Lions Club of Metropolitan Hong Kong (Honourary Secretary 2010-2011). I also organize unofficial events for McKinsey alumni in Hong Kong. Building websites during my spare time is one of my hobbies. Click here to see a list the sites, including alumni sites, hobby sites.